Is there a more magical combination than a boy and a dog? Haatchi and Little B by Wendy Holden has reaffirmed that there isn’t. The relationship between Owen and Haatchi is truly one of a kind. Their unique and powerful bond is one that will not be easily broken—or forgotten. Cruelty to animals is a heinous thing, and Haatchi, an Anatolian shepherd, survived the unthinkable. Whacked in the head and tied to railroad tracks as a train approached, Haatchi somehow survived. He was rescued by kind people and made his way through many rescue personnel and organizations. Though Haatchi lost a leg and endured challenges, he did not become aggressive and was a delight to those who worked with him. Finally, Haatchi (who is named after the famously loyal Japanese dog, Hatchi) found a forever home. His closest friend is Owen, a young boy with physical challenges of his own. Owen suffers from the rare Schwartz-Jampel disorder that affects his breathing and muscle development. When Owen met Haatchi, he became less withdrawn and was able to better interact with the world. 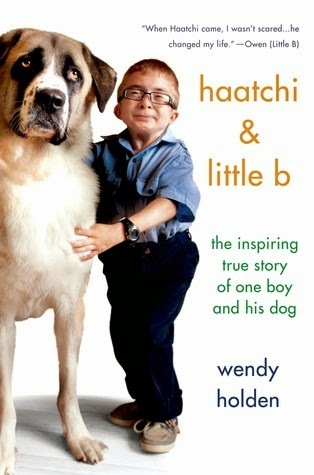 Written in a straightforward, uncomplicated style, Haatchi and Little B was an easy and inspiring read. Owen’s father, mother, and step-mother work together to continually improve his quality of life, and it was a delight to read about how much support and love they have received. My only complaint was that the book would have been far better had it focused on the feelings of the people involved, rather than on the events (such as awards, fundraisers, etc.) Since I am not English, the significance of many of these flew right over my head. In addition, in some places, the book read more like a list of events rather than a touching tribute to a boy and his dog. I was not a big fan of the inclusion of the “doggy talk” Facebook page postings, either, but I can see why some other readers might think they are cute. In short, I really think this is a remarkable story of a boy and his dog and is an quick read. A tighter focus and more insight into the people who populate the book would have enriched my reading experience.